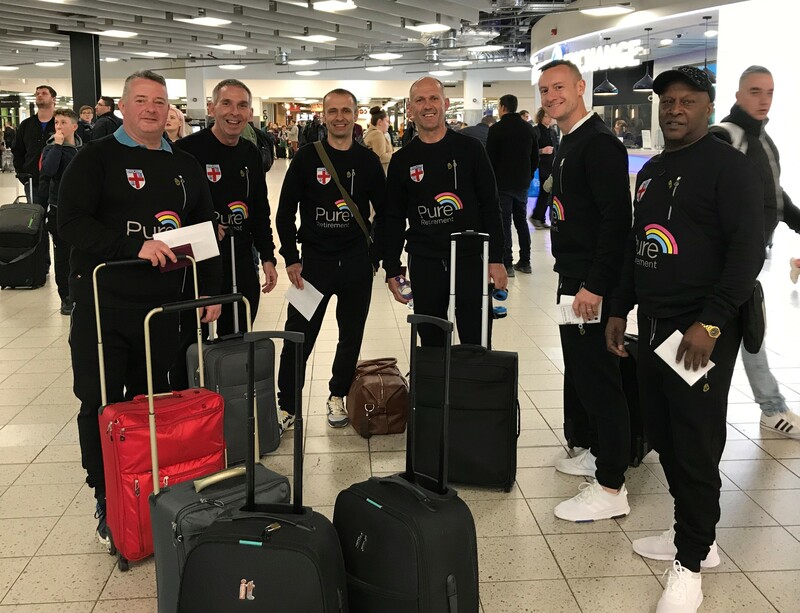 England over 50s and 60s Walking Football teams travelled to Novara, near Milan for their latest international matches. Having created history in May 2018 by playing the first ever Walking Football International match at the AMEX stadium, Brighton, the Italians were out for revenge. The over 60s team put in a superb performance with over 30 attempts on goal. They hit the bar, hit the post twice and had a goal disallowed and the Italian goal-keepers, with a mixture of superb saves and a good slice of luck, managed to keep England out. The players demonstrated a fantastic attitude despite the surprise of finding tiny goals, the language barriers and some interesting interpretation of the rules. One deflected goal mid-way through the first half for the Italians turned out to be the deciding goal and, try as they might, England could not get the goal back, despite peppering the Italian goal. There were several good performances – John Sykes and John Hammonds, in goal, only really had one shot each to save, which speaks volumes about how well Vic Vaines, Graham Curry and Stephen Berresford defended. Steve Borrow, who had a goal disallowed, Graham Collier, Peter Stacey and Spencer Pratten all had many shots which were either saved or marginally wide and Alan Davies was a constant threat up front. Alan was given man-of-the-match by the Italians and Steve Borrow given man-of-the-match by our coaching team. We would like to thank our hosts who looked after us with superb facilities in a lovely hotel over an enjoyable weekend. The Italians at both ages had improved since our last meetings last year at Brighton. Both games were streamed live and the feedback we have received has been generally very positive with comments such as ‘how did you not win that game’ and ‘you absolutely battered them in the second half but just could not get the vital goal’. We are looking forward to welcoming them to the European Nation’s cup in chesterfield in June. Overall. A fantastic experience. Lots of positives to take away in terms of performance and attitude. Still lots to learn both as a team and also as a sport as it continues to grow and go global. So, in nearly three hours of football only 2 goals were scored in open play – which says a lot about the size of the goals as well as the quality of the goal-keepers. England’s Over 50’s toiled in the drizzle at Noverello Stadium as they played out a somewhat dull 0-0 draw. Italy started the better team as England struggled to settle and they almost capitalised on some uncharacteristic slack passing from the visitors, calling keeper Rob Keating into action to make a couple of fine saves. England eventually started to get a grip on the game midway through the first half as the Italians reverted back to defending deep and narrow in front of the incredibly small goals! Paul Walton came closest to scoring in the first half as his shot was tipped over by the Italian Captain and keeper Luigi Martinoli. The second half was a little more open but time and again shots were deflected and blocked as the steadfast Italian defence seemed like they were impregnable. Paul Kirby’s rasping shot hit the post and the keeper before agonisingly going wide. Mike Milligan also struck the upright and as much as England pressed there appeared to be no way through. Ian Ward replaced Neil Evans in the second half and his inventiveness seemed to create more openings, his own turn and shot grazing the post as he looked to have put the visitors in the lead. England continued to press and actually left themselves open in the final few minutes and but for an excellent interception by Trevor Hanson, Italy would have had a one on one with the England keeper. A penalty shootout ensued, and Manager Paul Murtagh looked for both experience and nerve, Milligan, Hanson and Walton were all keen to take England’s penalties. Neil Brown won the toss and Milligan stepped up, his firm shot just managing to creep under the keepers’ body. Next, Italy’s Zafforoni looked nervous as he stepped back, Keating dived to his right and saved brilliantly to keep the score at 1-0. Blackburn Captain Trevor Hanson then stepped up to hit an unstoppable shot into the top corner to make it 2-0. Valentino then converted for the Italians. At 2-1 Paul Walton had the chance to make England’s lead unassailable, he sent the keeper the wrong way and in converting gave England their fourth victory from as many international games. Manager Paul Murtagh commented ..
“By far our toughest challenge yet! Credit goes to the Italian team who were unrecognisable from the last time we played them. Resolute in defence and creative going forward they have proved that they will be a force to be reckoned with at the Euros. I was really disappointed with how we started the game but pleased with the character shown by our lads to knuckle down and dominate thereafter, especially in the second half. A few things to still work on but as with everyone else in the new sport we are still learning”.